Just what is the Chattanooga Choo Choo? - Application for Pardon - Application Granted! !Application for Pardon – Application Granted!! « What is an Evangelical? Just what is the Chattanooga Choo Choo? Chattanooga is a town in Southern Tennessee close to the Georgian border, most famous for its Choo Choo – but exactly what is the Chattanooga Choo Choo? According to Chattanooga.com: “it’s a train, it’s a song and it’s a (sic) hotel” which sounds more like a plagiarized superhero description than a clarification. However, let’s look at why all three are referred to as the Chattanooga Choo Choo, starting with the train. The Chattanooga Choo Choo train is believed to have been the wood burning steam locomotive operated by the Cincinnati Southern Railroad, which first operated out of Cincinnati on 5th March, 1880 bound for Chattanooga. ‘Choo Choo’ was the affectionate name given to all the wood burning steam locos of the era, and the final destination gave rise to the alliterative moniker ‘Chattanooga Choo Choo’. Following the demise of the steam era, most of the trains were scrapped, but a fine example of the early Chattanooga Choo Choo locomotives that ran on the Cincinnati line has been preserved and is on permanent display at the Terminal Station in Chattanooga. There are other exhibits from the steam age at the Station as well, and train devotees in search of more Choo Choo memorabilia can also visit the Tennessee Valley Railroad Museum in the suburb of East Chattanooga. The song “The Chattanooga Choo Choo”, on the other hand, was an arrangement performed by the Glenn Miller Orchestra in the 1941 movie Sun Valley Serenade and features the immortal line: “Pardon me boys, is this the Chattanooga Choo Choo?” The lyrics make reference to Track 29 and that is the line on which the display locomotive now rests at Terminal Station in Chattanooga. One of Miller’s most memorable numbers, it earned the band leader a gold disc in 1942 for sales in excess of 1.2 million. And finally, the Chattanooga Choo Choo is also a hotel and convention center spread over 24 acres in central Chattanooga, which features the original Choo Choo steam locomotive. This is the only hotel in Chattanooga which offers Victorian Train Cars as hotel accommodation. It is also features the “Dinner in the Diner”, which is a restaurant offering fine dining that is housed in an early dining car. So although there are three definitions of the Choo Choo, it is evident that two of them – the song and the hotel – owe their entire existence to the original and definitive Chattanooga Choo Choo; the steam locomotive train from the 1880s. And although the Choo Choo is undoubtedly one of the main reasons why most people visit Chattanooga, the town offers a lot more. 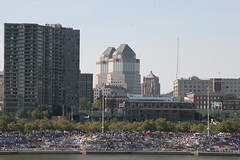 It is also home to the Tennessee Aquarium, an IMAX cinema and the Creative Discovery Museum. Nearby are the Lookout Mountain attractions which include the Ruby Falls, Rock City Gardens and the Incline Railway. If you go to Chattanooga looking for a Choo Choo, you’ll find all three – as well as a marvellous city offering warm, southern hospitality. Andrew Regan is a freelance online journalist.